and cause the sacrifice of others to be unclean. Let's make this real simple for those who may not be familiar with the "shadows" of ceremonial law. understanding of course what those things represent spiritually. that doesn't mean what he or she is teaching is the truth. and cause the sacrifice of others (their offering in the felt lined plate) to be unclean. i.e. a spiritually dead person! (See note in the Companion Bible). as we shall see in the next verse when Haggai answers back. Note: In the 37th chapter of Ezekiel, God uses graphic imagery to allow us to visualize this spiritually dead condition of our people. 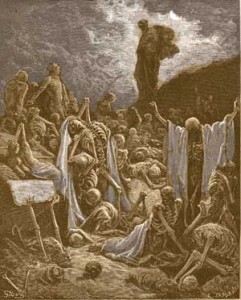 The prophet Ezekiel "sees" a valley full of "dry bones", symbolizing spiritually dead people, and he is told to teach "them dry bones" the Word of God, the breath of life, and life did enter into them and they stood up and lived (Ezek. 37:10). That valley is in the "so-called Christians nations Europe and the Americas" (next vs. in Haggai), where the descendants of the ancient true "House of Israel" live today. Ezekiel 37:11 "Then he said unto me, Son of man, these bones are the whole house of Israel: behold, they say, Our bones are dried, and our hope is lost: we are cut off for our parts." Where is "the whole house of Israel" today? They are the Christian nations of today's world. Live Link to- "Do you know who you really are?" Live Link to- Can these spiritually dead people be saved? "So is this people" what? So is this people, this whole nation, a bunch of "dead souls", i.e. spiritually dead. will sanctify them and make them whole. your good works become unclean, even iniquitous. These are not atheists nor people of other faiths or religions. These are present day Christians who say, "Lord, Lord, Praise the Lord", every Sunday. If you want to attend the wedding "feast"
even those He speaks through His servant Haggai. People do many wonderful charitable works in the name of Christianity, but these poor spiritually "dead souls" do not "do the will of their Father". In fact, most are so Biblically illiterate they do not even know what His will is! That is not a criticism of our beloved brothers and sisters, but merely a statement of fact! between God's Word and the traditions of men! and they truly and sincerely think that their sacrifices (offerings) and works will sanctify them. Consider what Jesus Christ will say to these hard working Christians "in that day", the day of His return! Again, these Christians do not believe that they are working iniquity. It is just that they are sorely deceived by priests and preachers who tell them Jesus is Lord all right, but then proceed to pollute the Word of God with the UNCLEAN traditions of men! Is that not exactly what Christ said would happen in these last days? saying, I am Christ; and shall deceive many." "Take heed" is "blepo" in Greek which means to "consider carefully". whose message is to be wise and "consider carefully"
your ways and the way in which you build God's house! or you are in big trouble when the "mighty shakings" come! Again, that foundation upon which we must build His house is Jesus Christ, the Word of God. There is much being said here, but let us at least understand this on a simple level. Consider the time and where you go from here! whose name means "sown or born in babel"! Remember? There wasn't much bread and wine produced, was there? then the LORD will not bless you. Moreover, He will even curse the filthy "works of your hands". The next verse documents it for us. Go ahead and "touch" the polluted bread and wine and oil and fruit from the hands of the unclean priests and preachers. God will send the pestilence and allow the "locusts" to come and consume all your gardens and vineyards and fig trees and olive trees. Which do you choose, Feast or Famine, Blessings or Cursings? by going to church and doing wonderful works in the name of Christ? By turning to His WORD! Again, consider, take heed, how things have been up to now! Think long and hard about it! How productive have the temple workers been? According to Rev. 7:1-4 we still have work to do and you know what? We learn from this great Book of Haggai that the LORD has promised to BE WITH US to the end and He has also promised to BLESS US if we do the job according to His will. You see, for God's elect, His servants, there need never be famine, for at His table there is always a "feast"! famine of these end times! Eat heartily and then get to work. You want to participate in His blessings? Again, the choice is yours... Feast or Famine! "His Word", is no longer left in the barn! We must take it out and make sure it gets sown and planted among our brothers and sisters! in order that we can discern between the clean and the unclean. Else how can we teach others? Live link to->> Unfortunately, most priests and ministers in this nation do not even know where true Israel resides today!